Zayvier Jones, 5, far left, and his sister Raelynn Dotson, 9, react after unveiling Zayvier’s small Grave Digger monster truck on Thursday. Standing next to the truck is Krysten Anderson, driver of Grave Digger and Ricky Durden of the Monster Jam crew. Zayvier Jones, 5, and his sister Raelynn Dotson, 9, react after seeing the Grave Digger facelift of his bedroom on Thursday while Krysten Anderson, driver of the Grave Digger holds a autographed pennant. Far right is Zayvier’s dad, Lance Corporal Justin Jones. 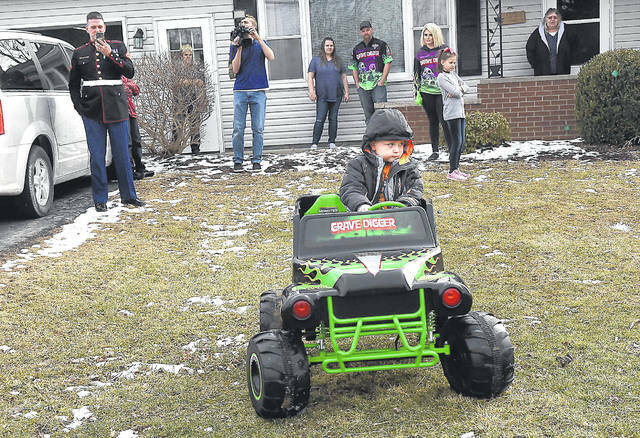 Zayvier Jones, 5, takes his Grave Digger monster truck for a ride around the front yard on Thursday. LIMA — Five-year-old Zayvier Jones arrived home from school Thursday afternoon thinking there was a wedding at his house with the yard full of cars and his dad picking him up in his military blues. Little did he know, his bedroom had been decked out in gear from his favorite Monster Jam truck Grave Digger, and its current driver, Krysten Anderson, was there to show it all off to him thanks to Operation Homefront, a national nonprofit organization committed to helping out military families in local communities. Jones is the son of Justin and Stephanie Jones, of Lima. Justin Jones is a medically-retired U.S. Marine who suffers from Post-Traumatic Stress Disorder and other injuries as a result of two deployments in Afghanistan. “This will probably be the one of the biggest things of his life that he will remember when he gets older,” Justin Jones said. “We’ve always wanted to take him to something like this but haven’t had the funds to do it. They had the 4-Wheel Jamboree out at the fairgrounds, but that’s not Monster Jam. The Joneses have four children, so Stephanie said she and her husband don’t get to treat their children to larger events like this. “It’s something they will all remember for the rest of their lives,” she said. 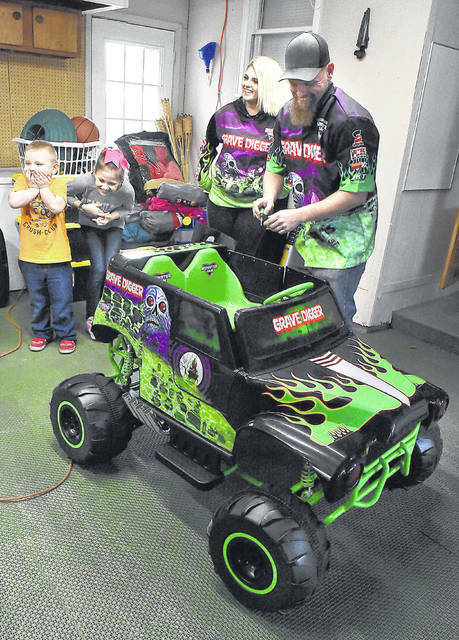 Along with the Grave Digger bedroom decorations, Operation Homefront and Monster Jam also gave Jones a 24-volt truck that zooms along just like his favorite that he will now get to go see this weekend at the Huntington Center in Toledo. “I just think it’s really cool to be able to give back to families that have given so much,” said Anderson, the daughter of Grave Digger’s creator Dennis Anderson. “Monster Jam is one of those things that you go to the show with your family and you forget about what’s going on at home or going on around you. But, again, Zayvier’s wish was able to come true thanks to the sacrifice of his father Justin. “This is very important to us [at Operation Homefront] because it can be very hard for them if they have PTSD or they’re wounded, it’s very hard for them to get help, so we try to source the help … anything they need, we try to give them,” said volunteer Patricia Marshall.